2. Wash bell peppers and remove tops and seeds. 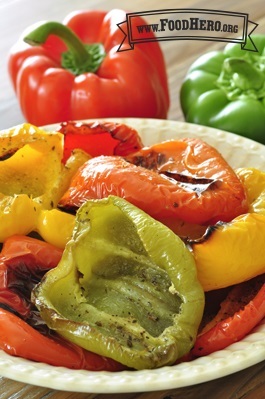 Cut peppers in half and rub with vegetable oil. Place cut side up on a rimmed baking sheet and sprinkle with Italian seasoning, garlic powder, salt and pepper. 3. Roast until peppers are tender and blistered in spots, about 30 to 35 minutes.